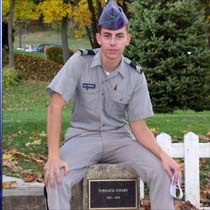 Matthew LaPorte is being remembered as a strong leader at his former military academy in Perry county. The 2005 graduate of Carson Long Military Institute was shot yesterday while attending classes at Virginia Tech University. The sophomore was attending Virginia Tech after receiving the Emerging Leader Scholarship from the University's Corps of Cadets 2 years ago. "He was a joy to have around, he had a great sense of humor," says Lt. Col. Rodney Grove, the schools Commandant of Cadets. "There's no doubt that Matt understood that at Carson Long he may have been a big fish in a small barrel but there was no doubt in my mind that when he moved to Virginia Tech he would continue to excel." Matt was attending his French class Monday morning when he and his classmates were shot. LaPorte from Dumont New Jersey came to Carson Long Institute in September of 1999 and attended classes from 7th through 12th grade. He served 4 years on the Drum and Bugle Corps and was the drum major his senior year. He was highly honored at the school and received multiple awards while attending. "Matt was a very calm individual," says Lt. Garry Hallman, LaPorte's former instructor, who also oversaw the cadet's dormitory. "Without even being there, without even seeing him, I can guarantee he wasn't one of the one's running and screaming. He would have been almost cool and logical in his approach but there was no time for anything." Hallman who has maintained a close friendship with LaPorte since his graduation 2 years ago was one of the first to hear of his former cadet's death. After hearing news reports on Monday he contacted LaPorte's parents in New Jersey who were nervously awaiting to hear from their son. At around midnight Tuesday, Hallman received a phone call from the LaPorte family saying that he was among the dead. Besides lowering the flag to half staff, the school of about 200 cadets is considering a memorial service to honor LaPorte.